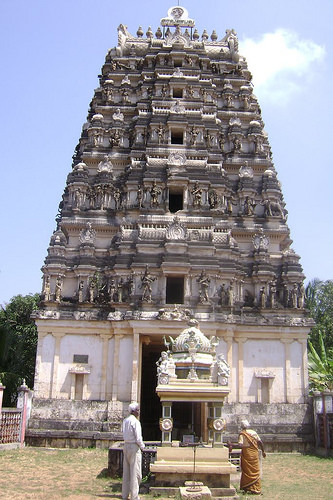 Maviddapuram kovil is one of the popular Hindu temple in Northern Province next to Nallur Kandaswamy kovil. This temple reflects the faith of Hindu devotees of this province. It is not only Tamils, the temple is popular among the Sinhalese as well. Restoration and renovation works of Maviddapuram Kanthaswamy temple are being carried out in a rapid phase. The temple administration has proposed several requests during the discussion with Governor of the Northern Province GA Chandrasiri. Deeply moved, Governor deposited one million rupees from Governor’s Trust Fund for the restoration works of Rajagopuam and compound wall of the temple to the Bank of Ceylon A/C number 76216427 – “Restoration committee, Maviddapuram Shi Kanthasuwamy Templ-Rajagopuram Project”. The estimation for renovation work is 300 million rupees. The temple administration has decided to raise the fund expected from organizations, philanthropists, well-wishers and public. Those who wish to contribute at this noble tasks are wanted to deposit to the above mentioned account number. It was decided to expedite the execution of the renovation works by providing proper inputs with the duly formed volunteers who are interested in. At first stage, staff of Governor’s Secretariat made a shrmadhana programme on 31st July 2014. We seek the support of scouts, youth clubs, and well-wishers. Let’s join in the holy tasks. It was proposed to construct a ‘nanthavanam’ (flower garden) around ‘Saravanapoikai’ (pond) to get flowers for the pooja. The restoration committee has decided to seek the support of Ministry and Department of Agriculture for this task. Any individual can also donate plants for this purpose. Let’s join the temple renovation!